The Final Fantasy X | X-2 HD Remaster is going to add a new 30 minute episode taking place during the game’s closing credits. A scan from popular Japanese manga magazine Jump claims that long time Final Fantasy series writer, Kazushige Nojima, will pen the content through his freelance company. However, it appears none of your colorful friends from Final Fantasy X‘s universe will be starring in the new episode as the scan claims that it will feature a new cast with new voice actors. Final Fantasy X is now over a decade old, ugh, and I’m sure most of the former actors have moved on at this point. Is there too much of a good thing? Spira is the most fleshed out and gorgeous in the series I think, so I would love to see more adventures throughout the Final Fantasy X universe. However, I remember feeling cheated once Final Fantasy X-2 cheapened emotional punch to the gut Final Fantasy X‘s pitch perfect ending delivered. Adding to perfection can only make it worse, and excess is not always a good thing, a fine rule video game developers have yet to learn. I’ll be watching this, but I’m keeping my expectations in check. The idea of Yuna and Titus’ kids, the new cast maybe, doesn’t sound too appealing. 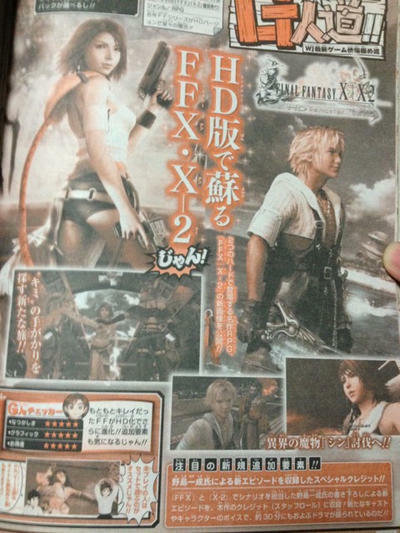 Final Fantasy X | X-2 HD will be released on the PlayStation 3 later this fall. Final Fantasy X is one of my all time favorite video games, so I can give a hearty recommendation. The $39.99 asking price is worth it for that game alone.